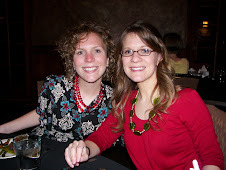 This was my saving grace for my husband's birthday a couple weeks ago. I found this recipe from Krafty Katrina and I want to make them again as I'm typing this. My husband is diabetic, and although this recipe is not sugar-free, it is much better than waffles drenched in syrup or cinnamon rolls smothered in frosting (although I love both of those options). I had NEVER made crepes before this attempt and they came out perfectly. We ate them all! Crepes are easier than they seem. They're kind of like good lookin' guys, intimidating, but undeservedly so. 1. Mix flour, sugar, baking powder and salt in medium bowl. Beat with hand beater until smooth. 2. Lightly butter 6-8 inch skillet. 3. For each crepe, pour scant 1/4 cup batter into skillet. Immediately rotate skillet until thin layer of batter covers bottom. Repeat with remaining batter, buttering skillet as needed. 4. Stack crepes, keep covered. 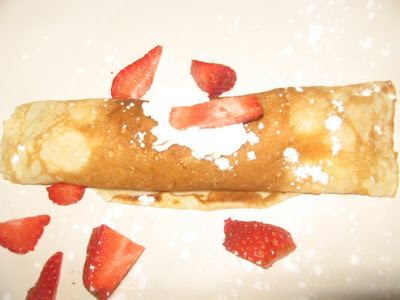 If desired, spread applesauce, sweetened strawberries, jelly, or jam thinly over each warm crepe; roll up. (Be sure to fill crepes so when rolled the more attractive side is on the outside.) Sprinkle with powdered sugar if desired. Unfilled crepes can be wrapped airtight and frozen up to 2 months.